Villa manager confirms Harewood loan. Any other loans? | NUFC Blog. 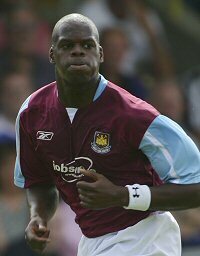 Martin O’Neill has confirmed that Newcastle are set to take Marlon Harewood on a 3-month ’emergency’ loan. The move should be completed by Friday. “Newcastle are still looking to do something in terms of Marlon. “I think they are waiting to hear whether they have permission from their owner to go and progress the move. “I think the opportunity for him now coming back from injury, to get involved in a cause, would be very important and only a benefit for all of us. “Marlon has been out since pre-season with injuries. He is fighting back, is feeling fine, trained for a few days on the trot. Harewood’s pretty low down the pecking order of Villa strikers but I would imagine he’d slot in as either the number 2 or number 3 striker at Newcastle and should be good enough to worry some defences in the Championship. A few days ago Hughton was said to be frustrated over some of his loan moves when he missed out on Stoke’s Leon Cort and Wolves’s Sam Vokes. Assuming we get Harewood, I wonder what other players Hughton is targeting (if any)? I still worry at our lack of depth and if previous seasons are anything to go by it’s not unusual for Newcastle to have half a dozen players in the treatment room at once. Sol Campbell is a free agent (I think) now that he’s left Notts County after just one game. There were rumours that Newcastle were interested in him at one point, although I would imagine his wage demand would be quite hefty. County’s chairman Peter Trembling said of Campbell: “he could not adjust to the long-term nature of the project under way at Notts County“. Marloan Harewood heading for Toon. The sad thing is that the lack of depth in the squad has been apparent for a couple of seasons now. However, I’m not sure if it’s ever been any different. Even in the good times we never had a big squad, probably why we never won anything. Everyone knows we have no strength in depth plus NUFC still isn’t a place half descent players would come with all the uncertainy around. Agree with mick we had are big money signings over the years mixed in with odd players from here there and everywhere. Look at the mancs two good players for each postion. Farming bass drinkers. Bowburn, this is what it was based on this quotation from an interview. He’s known that for a long time, but some people will always seek to undermine him at every opportunity. Everyone has been calling for reinforcements and we aregetting some. Due to our financial predicament it appears that loan players make sense to help bolster the numbers as they are all we can afford at present. Clearly it can’t be a long term strategy but it makes sense in the short term. I don’t want to see ‘big al’ as manager but it appears we have to be resigned to seeing him there. Hope he doesn’t disrupt the dressing room with his massive ego and lack of tactics. What makes you think he is going to get us out of this ‘micky mouse’league. We are where we deserve to be and it has been on the cards or on the verge of happening for years. Well at least you’re not judging Shearer then…. Stu – We’ll see Stuart, but I think I can guess what he will be like. Are you saying he hasn’t got a massive ego or didn’t look clueless? I think Harry Potter would have looked clueless with that bunch of players. Their heads were in a complete mess and they didn’t know whether they were coming or going. The one thing we do know is he put a discipline at the club which hadn’t been there for a long while. Some won’t have like that and they are the ones that need shipped out. His ego – Which successful footballer/manager is as shy as a bairn? They’ve all got big egos. “I think Harry Potter would have looked clueless with that bunch of players. Of course they didn’t know if they were coming or going Stuart, they had a different manager every five minutes. As for all managers having “big egos”, I wouldn’t say that people like Bobby Robson or Roy Hodgson had especially big egos, would you?